People of African origin have lived in Britain for centuries, according to genetic evidence. A Leicester University study found that seven men with a rare Yorkshire surname carry a genetic signature previously found only in people of African origin. The men seem to have shared a common ancestor in the 18th Century, but the African DNA lineage they carry may have reached Britain centuries earlier. 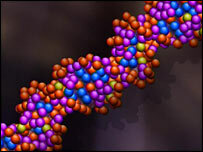 Details of the study appear in the European Journal of Human Genetics. The scientists declined to disclose the men's surname in order to protect their anonymity. The discovery came out of genetic work looking at the relationship between the male, or Y, chromosome and surnames. The Y chromosome is a package of genetic material normally found only in males. It is passed down from father to son, more or less unchanged, just like a surname. But over time, the Y chromosome accumulates small changes in its DNA sequence, allowing scientists to study the relationships between different male lineages. Y chromosomes can be classified into different groups (called haplogroups) which, to some extent, reflect a person's geographical ancestry. Certain haplogroups might be very common in, for example, East Asia and very rare in Europe. By chance, the researchers discovered a white man with a rare Yorkshire surname carrying a Y chromosome haplogroup that had previously been found only in West African men. And even there, it is relatively uncommon. "We found that he was in haplogroup A1, which is highly West African-specific," said Turi King, a co-author on the study at the University of Leicester. "It is incredibly rare, there are only 25 other people known worldwide and they are all African." The individual had no knowledge of any African heritage in his family. Sharing a surname also significantly raised the likelihood of sharing the same type of Y chromosome, with the link getting stronger as the surname gets rarer. So the researchers started recruiting people with the same last name, which starts with "R" and originates in Yorkshire. Of 18 people they tested, seven carried the rare African haplogroup. Turi King and Leicester colleague Mark Jobling then commissioned a genealogist to fit the men into a family tree to see how they were related and find clues about where exactly their unusual Y haplogroup came from. "He could only get them into two trees, one which dates back to 1788 and the other to 1789. He couldn't go back any further. So it's likely they join up in the early 18th Century," said Turi King. The majority of the one million people who define themselves as "black" or "black British" trace their origins to immigration from the Caribbean or Africa from the middle of the 20th Century onwards. Prior to the 20th Century, there have been various routes by which people of African ancestry might have reached Britain. For example, the Romans recruited from Africa and elsewhere for the garrison that guarded Hadrian's Wall. Another major route was through the slave trade. "Some of the Africans who arrived in Britain through the slave trade rose quite high up in society, and we know they married with the rest of the population," said Ms King. "It could be either of these two routes," she said. Even if the two family trees link up in the 18th Century, haplogroup A1 could have reached Britain long before that. "But my guess is that, because many slaves came from West Africa, it could have been through that route," Ms King told BBC News. She added that the study showed that Britain has always been composed of a mosaic of different people. Professor Jobling echoed this view: "This study shows that what it means to be British is complicated and always has been," he said. "Human migration history is clearly very complex, particularly for an island nation such as ours, and this study further debunks the idea that there are simple and distinct populations or 'races'." Turi King said she had since found another African Y chromosome haplogroup in a different British lineage. There are other precedents for the finding. The third US president, Thomas Jefferson, probably had a Y chromosome belonging to the haplogroup known as K2. This discovery came out of a project to determine whether he had fathered children from Sally Hemings, a slave owned by Jefferson. The president had no surname-bearing progeny, so researchers had to test male-line descendents of his paternal uncle. Jefferson's father claimed Welsh ancestry. But his Y-haplogroup is rare in Europe and has not yet been reported in Britain. 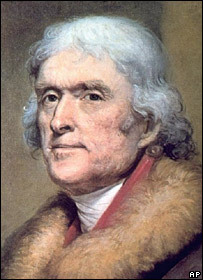 In fact, genetic studies show that Thomas Jefferson's K2 haplogroup ultimately came from north-east Africa or the Middle East, the areas where it is most commonly found today. The research on haplogroup A1 was funded by the Wellcome Trust.